I often walk through the park instead of walking around it. I see something or learn something new every time. Being in the park is a great opportunity to talk with people, neighbors, strangers and the parks staff. They share their concerns, their personal histories and often their gratitude. I am often asked what does the Marcus Garvey Park Alliance do?, what we do is inspired by those walkthroughs and conversations. The fear of loosing cultural visibility is a recurring theme, wether I am talking with someone in the park, on the street or at public meetings. So the Marcus Garvey Park Alliance has incorporated maintaining cultural identity as a part of our mission. We are “creative placemaking” in Marcus Garvey Park and nearby parks and public spaces in the neighborhoods of Harlem. 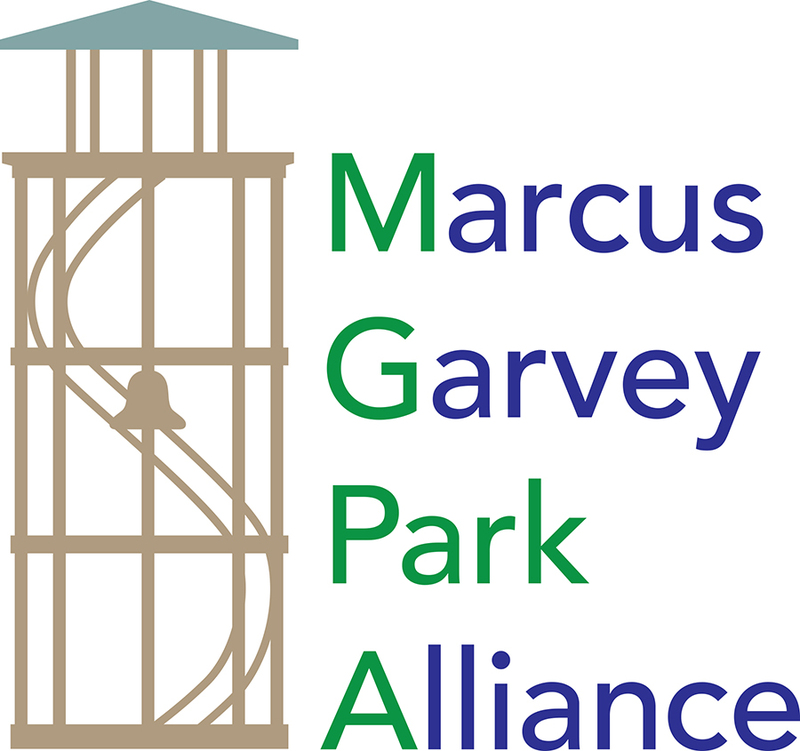 I think the best way to answer the question, what does the Marcus Garvey Park Alliance do? is to share what we have done in the past year, working collaboratively with uptown artists and arts organizations to celebrate and preserve the creative culture that Harlem is famous for. Collaborating with Jazzmobile, as we often do, we began the summer of 2018’s cultural programming with a tribute concert to Harlem based composers and ended the season of cultural programming in the fall with the 3rd annual El Barrio Latin Jazz Festival. In between we collaborated with the Capoeira Center of New York and also screened a documentary about Marcus Garvey with Firelight Media and ImageNation. Our creative partners share their expertise helping us to bring culturally significant and high quality FREE performances to the Richard Rodgers Amphitheater in Marcus Garvey Park. In 2018 the Marcus Garvey Park Alliance also produced three public art installations, curated by myself and facilitated by the Public Art Initiative Committee creating opportunities for artists who live and work in the community. Two installations in Marcus Garvey Park share a common theme, women of color. The third installation on view in Harlem Art Park tells the story of the neighborhood over several decades. Nicknamed Anita, the sculpture sits as an honored monument of watchfulness on the base of the mountain in Marcus Garvey Park. On View October 21, 2018 – September 30, 2019. Artist Kim Dacres envisioned a figurative bust-like structure; resonating as female, representing women of color. They are the civically-minded guardians of (public)spaces in Harlem. They are present and watchful in classrooms, parks, libraries, salons, corners, and businesses. The bust is fabricated with discarded tires, the tires are ubiquitous and have value beyond their obvious functional use. This female figure, “PeacefulPerch”, aka Anita embodies the ubiquitous presence of race and the female form. To position the bust elevated and outward facing, Dacres collaborated with artist Daniel Alexander Matthews who created a sculptural base molded with Hydrocal and slivers of the rubber material used in the bust. Funding for this project was provided by the Marcus Garvey Park Alliance Public Art Initiative with additional funding provided by the Harlem Community Development Corporation, Manhattan SWAB Reuse and Repair administered by Citizens Committee for NYC. Rubber Materials were donated by Harlem Bolt bike shop. For this installation the artist, Kathleen Granados, embraced the Harlem Art Park site, a place resonating with history, energy, and diversity. This invaluable community site, now facing increased gentrification, is celebrated through the memories, stories, and the strong roots of people from the neighborhood. The artist’s installation knowingly highlights historic moments and contemporary culture with photographs which the artist collected from various residents, community organizations, institutions and NYC Parks Photo Archives. These photos depict moments, events, places, and people from the communities past and present. Granados artistic lens elevates these scenes by converting the digitally scanned photographs into laser etchings on colorful Plexiglas. The fence of the Art Park provides the backdrop for each image as park visitors can catch a glimmer of sunlight reflecting from some of the mirrored tiles and walk the periphery of the park where the images on laser etched tiles are interwoven into the grid of the park trellis. The trellis, thus, becomes a frame for each image. Park visitors will notice they, themselves, become part of the artistic narrative as they look into the mirrored tiles, viewing both the memorable moments depicted, and their own reflection. Presented by the Marcus Garvey Park Alliance in partnership with Friends of Art Park Alliance. New images will be added to the trellis throughout the year as the East Harlem Photo Album story continues to evolve. On View August 11, 2018 – August 10, 2019, Harlem Art Park is located on East 120th Street between Lexington and 3rd Avenue. This installation is part of the Art in the Parks: Active Open Space project, a partnership between NYC Parks and the New York City Department of Health and Mental Hygiene, in collaboration with the Fund for Public Health in New York and the Centers for Disease Control and Prevention, to activate park space with health-inspired art installations that promote physical activity and strengthen community connections. Funding for this project was made possible by the Centers for Disease Control and Prevention.” Additional funding was provided by the Harlem Community Development Corporation. Jose’ Carlos Casado, I Don’t Know Why the Caged Bird Sings, Ah Me…. José Carlos Casado thinks back to some of his earliest recognized work: a photograph that won a competition in Spain 26 years ago. “The picture was titled ‘Woman, Lesbian, and Black.’ The race, you couldn’t see — it’s just a shadow, its very abstract in a way,” he says describing the photograph. “My work always has some sort of political and social background.” Abstractions in Casado’s work, set the framework for a conversation, Casado, is neither woman, nor lesbian, nor black, but he utilizes his art as a way to connect with, question interrelation and demonstrate alliance. I Don’t Know Why the Caged Bird Sings, Ah Me... is made possible in part with funding from the Upper Manhattan Empowerment Zone Development Corporation administered by Lower Manhattan Cultural Council. Funding has also been provided by the Marcus Garvey Park Alliance Public Art Initiative. Additional funding provided by the Harlem Community Development Corporation, Socrates Sculpture Park and Council Member Bill Perkins. A celebration of former Harlemites: Eubie Blake, Duke Ellington, Oscar Hammerstein, Richard Rodgers, Nobel Sissle, Fats Waller and the music they brought from Harlem to Broadway. The concert was co-presented by the Marcus Garvey Park Alliance and Jazzmobile on the first night of summer as part of Make Music New York in partnership with the New Heritage Theatre Group. Additional funding was provided by Historic Harlem Parks and Artimus Construction. Bobby Sanabria, 21 piece Big Band Multiverse performed to a standing room only crowd at the 3rd annual El Barrio Latin Jazz Festival. Actually the crowd wasn’t standing they were dancing and at times singing the lyrics. The Latin Jazz Festival was founded by former Marcus Garvey Park Alliance board member Jeremy Vega and in only 3 years has become one of the most attended events in the amphitheater attracting visitors from throughout the city, a perfect compliment to the Charlie Parker Jazz Festival. Presented in collaboration with Jazzmobile and sponsored by the Marcus Garvey Park Alliance with partial funding provided by the Harlem Community Development Corporation and Historic Harlem Parks with funding from Whole Foods Market. Presented in collaboration with Firelight Media and ImageNation, MARCUS GARVEY: LOOK FOR ME IN THE WHIRLWIND uses a wealth of archival film, photographs, and documents to uncover the story of this Jamaican immigrant who between 1916 and 1921 built the largest black mass movement in world history. The film explores Garvey’s dramatic successes and failures before his fall into obscurity. Among the film’s most powerful sequences are interviews with people who witnessed the Garvey movement first hand more than 80 years ago. These interviews communicate the appeal of Garvey’s revolutionary ideas to a generation of African Americans, and reveal how he invested hundreds of thousands of black men and women with a newfound sense of pride. Partial funding was provided by the Harlem Community Development Corporation and Historic Harlem Parks. A first time collaboration with the Capoeira Center of New York was an opportunity for the Marcus Garvey Park Alliance to bring the martial arts inspired dance form to the amphitheater stage for the first time. Harlem Celebration of Capoeira was made possible in part with funding from the Upper Manhattan Empowerment Zone Development Corporation administered by LMCC and the Phillips Charitable Foundation, Historic Harlem Parks with production assistance provided by the Marcus Garvey Park Alliance. Three FREE libraries and tens of thousands of books given away to children and adults are celebrated each summer with a series of events where volunteers, guest authors and performers share their love for reading with children from the neighborhood and nearby day care facilities. Special thanks to the Uni Project for joining us each week throughout the summer. Piano Buddies Lynn Lieberman and Cynthia M. Reed waiting to close up the piano for the night. The day we had 5 Sing for Hope pianos in Marcus Garvey Park. For the 3rd year in a row the Marcus Garvey Park Alliance hosted a Sing for Hope Piano in Marcus Garvey Park. It takes a village to open and close the piano everyday and run over at a moments notice if it looks like rain. Thanks to this years Piano Buddies who took care of the piano everyday for 3 weeks. Lynn Lieberman, Cynthia M. Reed, Susan Huck, Connie Lee and Laura Mead. This years Sing for Hope piano was designed by students from Harlem School of the Arts. Every Saturday, beginning the first week of June through the Saturday before Thanksgiving the Marcus Garvey Park Alliance sponsored farmers market was set up along the perimeter of Marcus Garvey Park at 124th Street and Mt. Morris Park West. Thanks to everyone in the community that came out week after week to support our vendors. As stewards of Marcus Garvey Park this is probably the most important thing that we do. The Marcus Garvey Park Alliance hosted so many volunteer events this year, I lost count. We even hosted 2 volunteer events in Thomas Jefferson Park to help out the Parks staff in district 11. I volunteer and get my hands dirty at every single event we host and I am grateful and appreciative of all of the volunteers who jump in and get their hands dirty too. Special thanks to Urban Garden Center and to the volunteers from Road Runners, NYPD Explorers, Matthew Westerby, Regina Jones, Alicia James, the Pam Project, Evelyn Cota, Susan Stair, Suzan Marciona, Susan Huck, Cynthia M. Reed and so many others who got their hands dirty and helped us to take care of Marcus Garvey Park, the Community Flower Garden and Thomas Jefferson Park. We won a Golden Trowel Award earlier this year from Partnerships for Parks for the work that we do. In 2018 we also did something a little different. Partnering with SummerStage we tabled at four of their events in Marcus Garvey Park. One night we hosted an open call to artists, inviting them to come out and learn how to get involved with the Public Art Initiative. At the other three events we invited park goers and community residents to share their ideas for the park with us. The information we gathered will influence the programming that we sponsor and facilitate in 2019. After a busy year and over 1500 volunteer hours, I will be taking some time in December to create a budget for the upcoming year and research grant opportunities. Help us get the next season off to an early start and consider donating to the Marcus Garvey Park Alliance.